Margaret Thatcher is, and always will be, a controversial figure. In her time it was unheard of for a woman to climb the political ladder, let alone to reach the top and remain in power for as long as she did. Never one for deferring to tradition, she spent her time in office changing society as she deemed fit, with her ruthless, self-assured nature losing voters, friends and colleagues along the way. To most people, this would be an excellent conceit for a straightforward, politically charged biopic. However, in the eyes of director Phyllida Lloyd and screenwriter Abi Morgan, it simply wasn’t enough. Keen to uncover the true Margaret Thatcher, the duo have instead opted to focus on her humanity, allowing the politics to act as a catalyst for the key moments in her personal life. Brave, right? But is it successful? Well, yes, in that it’s intermittently compelling and on the whole affecting. However, the more you scratch the surface the more noticeable the holes become, leaving you suspicious that most of what is being shown post-Thatcher’s reign is assumed rather than concrete fact. It’s not that Morgan’s screenplay doesn’t provide an interesting take on the lady, it’s that the telling isn’t as fruitful or coherent as you may expect from such a dynamic and acclaimed writer. In some ways, the same can be said for Lloyd’s direction. Having hit the big time with the schmoozy musical affair that was Mamma Mia!, Lloyd’s elevation to presenting dramatic material seems to have come too fast and with too many shortcuts. Amalgamating several different styles – from kitchen sink drama to the pseudo-documentary – Lloyd is somewhat out of her depth, unsure of which style best suits her colleague’s efforts. Much of how this story is presented – direction, editing and soundtrack – appears to have been pieced together from other films in the vein of The King’s Speech and The Queen. Distracting as this is, credit must be given to the sheer bravado involved in bucking convention and making such a potentially embarrassing biopic of a subject who is still very much alive. Covering many of the emerging cracks, Meryl Streep’s almost earth-shudderingly accurate performance as Thatcher in her prime is flawless. Almost unrecognisable, she inhabits the role with every scowl, grimace and mischievous smile. She’s simply that good. Fortunately, Alexandra Roach is almost as distinguished in her turn as the youthful Margaret, believable in her partnership with Streep. 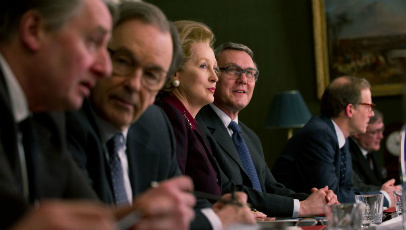 Jim Broadbent makes the secondary role of Dennis Thatcher his own, infusing elements of humour, tenderness and compassion into a man so overshadowed, yet integral to Thatcher’s life. However, the dynamic between the older and younger representations of the character is not nearly as convincing as that of Streep and Roach. Harry Lloyd’s performance is unremarkable, never gelling with Broadbent’s masterful interpretation. Meanwhile, Anthony Stewart Head, Richard E. Grant and Roger Allam are the pick of the above-average supporting cast, each as memorable as the other. The Iron Lady is a coercive if slightly vague portrait of the controversial woman, defiantly avoiding the political focus so often embraced. Streep, alongside a well-rounded cast, elevates this above its potential to be a mediocre mash-up of well trodden tropes, resulting in a film that’s well worth the hype, albeit in a less than conventional manner. Good review. Just got back from seeing this. I felt it was a brave approach and one that paid off – the film concentrated more on her struggle with dementia and played this against the figure she once was. The result was a touching and sometimes moving portrayal of what is to some a very hated figure. As for Meryl Streep, if she doesn’t win the Oscar for Best Actress something is seriously wrong. It was without a doubt absolutely masterful. I thought it was very brave as well to tackle her life the way they did rather than placing the emphasis on her political career. Meryl Streep deserves any awards she wins! I agree that it was very brave. I also would say that the problems you mention didn’t bother me quite as much as they did you. It was an odd situation, where they were definitely, rather blatantly there, but the rest of the film was compelling to the point that they didn’t shatter immersion in the way they normally would. I came away wanting to talk about whether it was appropriate, rather than wanting to pick apart the flaws. It’s a subtle distinction, but one that’s much more satisfying in the end. Great review. Did it feel to you that Lloyd was just so desperate to work with Streep again? Would it have been more poignant (and possibly successful) if released after her death? I think it has a real swansong element to it, as if she was already dead. Yes, that’s exactly how it felt. Unfortunately, I think Lloyd went in a little too inexperienced, and the film suffered for it quite a bit. And it’s a yes to your second point, too. I honestly thought at the end, when she was ironically washing a tea cup, Lloyd would have her collapse or do something to hint at her possible death. That’s what I thought – I kept expecting something to make me jump! I wanted to read your review again after watching Shame last night and realising how different the two Morgan beasts were. They’re very different. I think it would’ve been hard for her with the Iron Lady script as there was probably a lot of boundaries and hoops she had to jump through for the studio and director, whereas for Shame it was very much a massive collaborative experience (so I here) that, well, worked incredibly well! Exactly, plus while remaining a little sensitive of the family in some respects. Brandon is a composite, so far more scope in the collaborative project, as you so rightly put it. Plus, Shame is all about pushing boundaries and being controversial, whether The Iron Lady is about painting a brighter portrait of a controversial woman. Absolutely. Both about completely different struggles. Ohhh Jamie, I really need to see Shame again – right NOW. Me too. It’s been SO LONG! I feel your pain when I’m like this after a day…!